You can carry the industrial, warehouse, rustic look all the way down to the simple table lamp. Every piece in a room deserves some attention and the simple desk light definitely needs some attention. If you are decorating with the rustic look, then why settle for a simple Walmart light? This little light is only 9.5 inches tall but will be noticed! The red valve has been worked to be the on off switch for this cool pipe styling. This is definitely rustic and I think would look great on a desk. If you want something unique and totally different, check out this industrial table lamp. 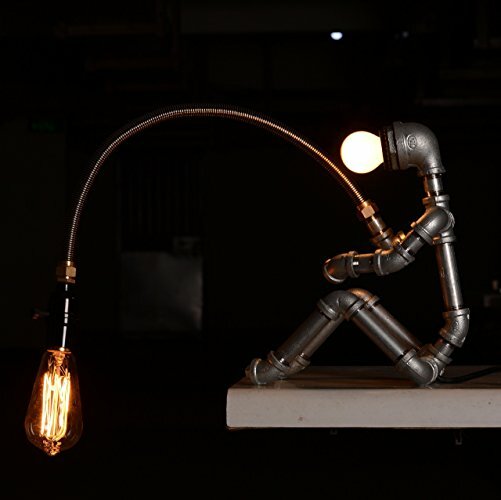 Created from water pipes and an edison bulb, this takes the warehouse rustic look to the next level. This piece will definitely be noticed in a room. Functional art at its best. Very steampunk! This unique table lamp uses wood and metal and a caged Edison style bulb to create an old world look. Perfect for any table, desk or bedroom. These are simple and yet add some pizzazz to your room. Industrial cage look around Edison style bulbs creates a good looking lamp. It includes the bulbs and is ready to go. This one has an open air to it, and yet will stand out on a desk, table or even bedroom. Fun way to go the warehouse rustic look. Handmade in the USA, using heavy duty black iron fittings, includes the caged Edison bulb. This is very rustic and would make a great gift too! I love these plumbing pipe lamps because they use the off/on valve as the switch giving it such an authentic appeal. The Edison bulb totally makes this lamp. It would look awesome on a desk or even the hall table for some extra lighting. This one has a glass cage and the rest is antiqued style industrial iron. I love industrial but it can seem a little heavy in some rooms, but you can also find an in between with a combination of rustic and industrial look mixed with a softer side such as this lamp that has a twisted metal look but is meant to be vines. It is something different. This one is something a little different, it is a glass head that sits on weathered wood with an Edison bulb inside. It would give off a nice glow and would definitely be something unique and different on your desk. I would use it more as a general light than a desk lamp but what a conversation piece it would be! You may think that no one will notice a table lamp, but if it is unique enough they will! Add some character to your lighting, but don't stop with the chandeliers and floor lamps, you can add pizzazz and fun with these unique table, desk or beside lamps that are still old world styling but safely wired. Many are like functional pieces of artwork! Let them be front and center. If you want something different, then heading to the internet is the way to go as I have found my local typical lighting stores don't tend to carry any rustic styles, it is nice to find something a little different that will make you smile when you switch it on. Desk lamps can make great gifts too, and they are fun to choose from. Pair them up with the Edison style bulbs and they will look very authentic old world industrial. If you have exposed brick walls then you can add a few different lamps around the room to add to the style and look of the room. Have fun! Also check out my other pages for more ideas!